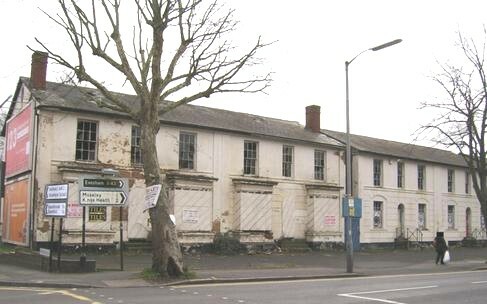 With the need for more housing in the news, instead of looking at ‘developing’ green spaces in Sutton Coldfield, Harborne and on Solihull’s floodplains, why not renovate buildings such as this long-neglected Georgian terrace sadly lining Highgate’s Moseley Road? With due attention the Highgate Terrace could look as good as the Edgbaston terrace (right) and even better if its windows were not disfigured by arranged net curtains. Birmingham historian Carl Chinn, writing about the nearby Highgate park, reminds us of Joseph Chamberlain’s words that it is the duty of the Town Council as representing and caring for all the community, to provide for ‘the people’ beautiful buildings and pleasant gardens which ‘the rich were able to provide for themselves’. The houses to be built in the ‘leafy’ areas mentioned earlier will not be offered to those on housing registers – those deemed to be in most need. Priority should be given to building new houses in the pockets of dereliction which may be seen in various areas of the city. “Roof slopes are steep, some with photo-voltaic solar panels. 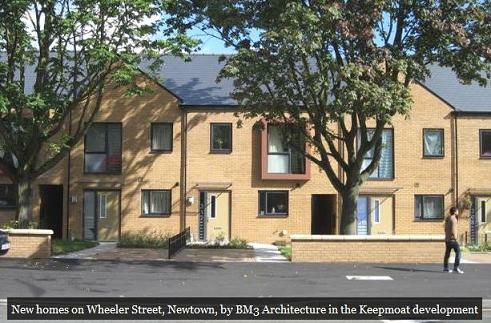 They make big house-gables – some eccentrically mono-pitched, some more conventionally dual-pitched. Windows are generously sized, and placed to make interesting domestic compositions”.